If you’ve had your eye on the 2014 Honda Pilot near Mechanicstown, come on over to Middletown Honda today and take one for a test drive. That’s right, we have Honda’s famous SUV in stock now, and if you thought it was impressive before, you haven’t seen anything yet. Built for work and fun, the Pilot has no trouble heading to the job site, hauling cargo, or taking the family on vacation. That said, there are many, many SUV choices on the market today. What makes the Pilot so special? Let’s see how the 2014 Nissan Pathfinder stacks up, and maybe it will become clear just why Honda’s SUV is one of the best. When we took a look at just what it was the separated these two popular SUVs, we had to look a second time to be sure we were reading it right. The Pathfinder has always been a solid choice for drivers, but for 2014 models, it is lagging behind the Pilot. Have you ever had to crawl into the cramped third row of an SUV? 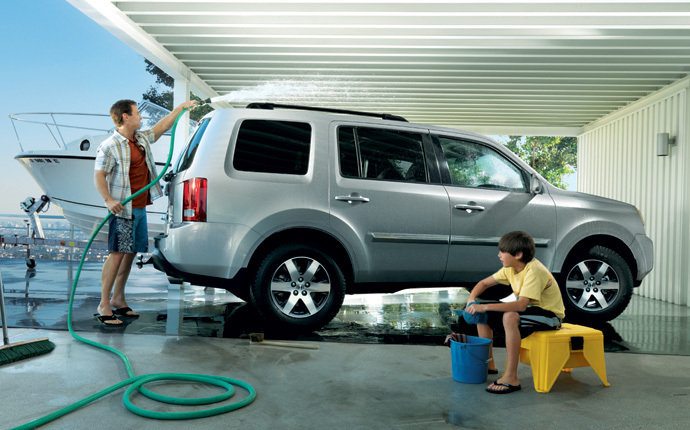 Your passengers won’t have to do that if you’re driving a Pilot; the 2014 model offers more third-row leg room than the Pathfinder. Honda also gives second and third row passengers more headroom, and all three rows of seating have more hip room, giving you plenty of space to stretch out. We know that the powertrain isn’t always on the mind of SUV drivers, but extra torque is never something to frown upon, giving you extra grip when you need it. And the Pilot offers up 253 lb-ft of torque compared to Nissan’s 240 lb-ft. Honda also includes Hill Start Assist in the Pilot, preventing the vehicle from rolling backward while stopped on a steep hill. While Nissan drivers could add on many of these or similar amenities to their vehicles, they will have to upgrade for them; Honda gives them to you at the basic Pilot LX trim level. We know that the odds seem overwhelmingly in favor of the 2014 Honda Pilot, but we want you to come and see it for yourself. Contact Middletown Honda and set up a test drive of this impressive new SUV. Get behind the wheel of a Honda today at Middletown Honda.